Knoxville is known for many things. Home of the Tennessee Volunteers. Gateway to the Great Smoky Mountains. The Scruffy City. That’s just to name a few. 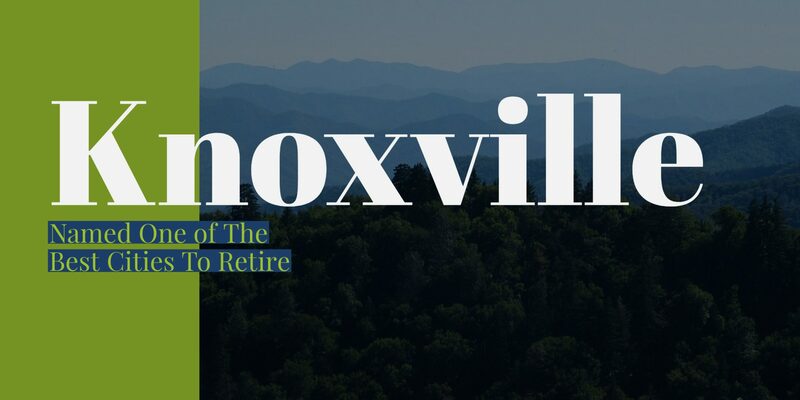 It’s no shock that Knoxville was on the list of best cities to retire, with its affordable cost of living, vibrant economy, and temperate climate. With affordable home prices and no state income taxes, Knoxville enjoys a low cost of living. There’s no shortage of activities in Knoxville with many different sports teams, a vibrant downtown, and the Great Smoky Mountains nearby. Earlier this year, Knoxville was named one of the cities Americans are flocking to and Knoxville was named one of the next urban powerhouses by Realtor.com. Also this year, Knoxville was named one of the Best Affordable Cities In The US. In 2017, Knoxville was named one of the hippest cities. In 2017, Knoxville was named one of the top 10 cities where outdoor lovers can afford to live. Also in 2017, Knoxville was named one of the hottest real estate markets by Zillow. Farragut was named one of the best cities to raise a family also in 2017. Knoxville was also named one of America’s Favorite Cities in 2017 by Travel + Leisure.